I’m pretty sure I’ve said before that I’m a sucker for these types of mini challenges. When I saw this post by one of my favorite bloggers, it called my name and demanded I link up. I’ve been a yoga lover for at least the past decade. And as you can imagine, it’s hard to keep up on pretty much any commitments I had in my pre-baby life. Such is life with a growing, bright-eyed, curious baby four-month old. But I re-learn everyday just how important it is to make sure I’m taken care of as well. 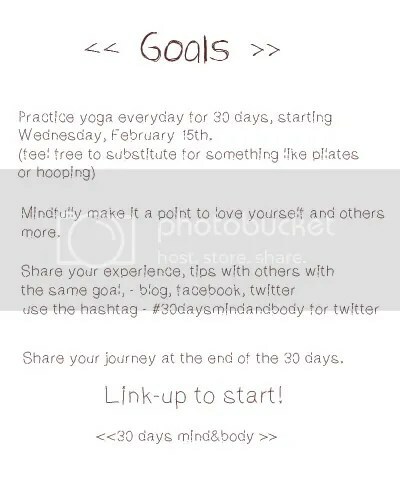 A 30 day yoga commitment (to start with, at least), sounds like a great way to make sure I’m giving myself that attention. And that very well be all I have some days! But 10 minutes is better than no minutes! I even have a new Mama & Baby yoga dvd I’ve been wanting to try out. Play along if you feel the urge! Click one of the buttons above to link up on one of the lovely founding ladies blogs.